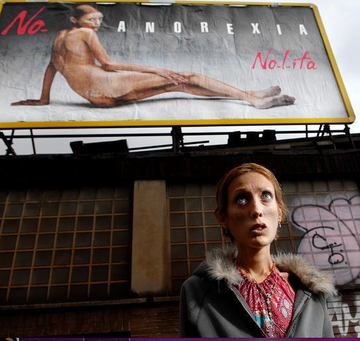 Isabelle Caro won fame by posing naked for a 2007 advertising campaign against anorexia by Italian fashion label Nolita. The intended message was: "You don't want to look like this." But in a celebrity-obsessed culture, too many people would do anything to see themselves up on that billboard–even adopt a look that is literally "to die for." For more on this lethal example of Girard's "mimetic double bind," read Why did Isabelle Caro die?